Staring at the computer for a long time may cause poor eyesight, light-headedness, or even pain in the neck and back area. 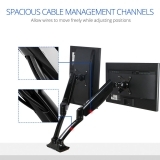 Our full motion desk mount can help alleviate these problems. 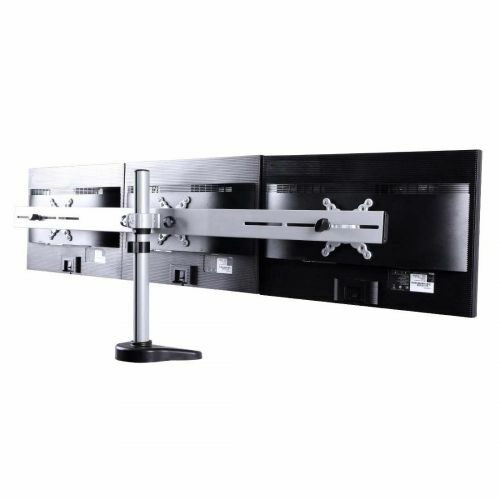 It allows for maximum viewing flexibility. 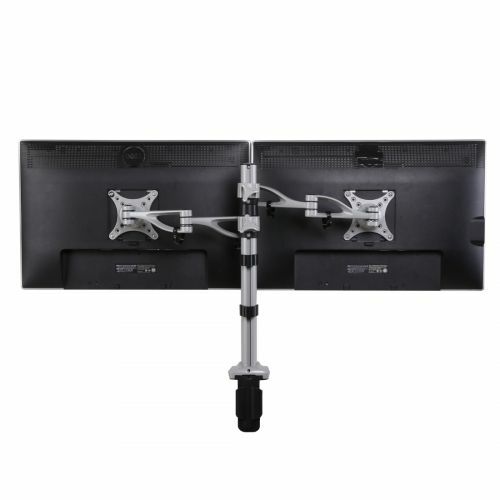 The desk top mount features tilt or swivel movement , providing easy viewing from any seat. 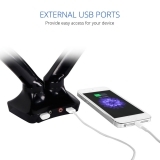 In addition, our desk mount with 2 port USB 3.0 Hub, which are convenient for connecting keyboards, mouse, or USB flash drives. 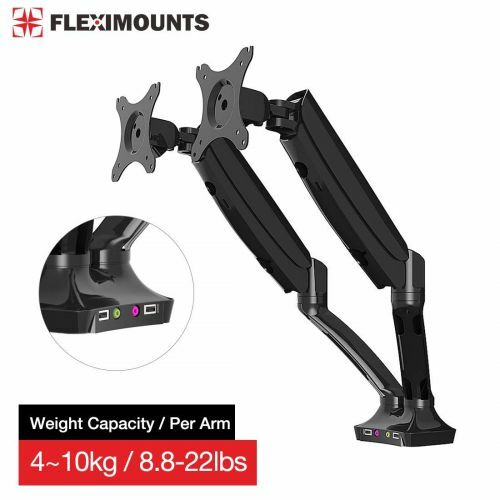 HEAVIER LOADING CAPACITY- Supports monitors of up to 8.8 to 22 lbs for each arm. TWO FRONT-LOADING USB 3.0 PORTS – convenient for flash drives, speakers, etc. 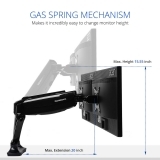 very high quality monitor mount! nothing to complain! My husband and I bought these stands for eachother for Christmas so we could set up double monitors. I have two LG 25 inch ultrawide monitors that are stacked one on top of the other. He has two LG 29 inch ultrawide monitors that are stacked one on top of the other. The mount holds them all really well and I have had no issues with feeling like the monitors are not secure. 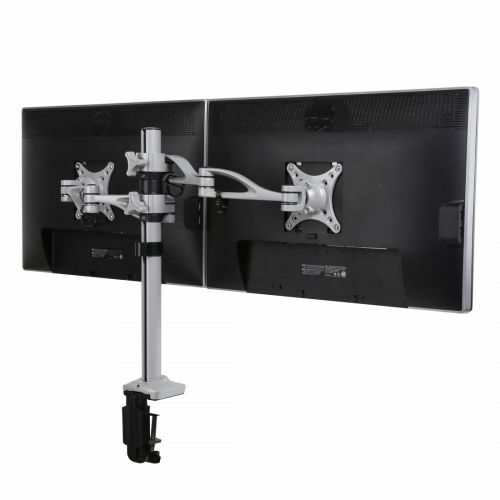 At first it was hard to understand that I had to mount the monitor onto the actual mount as it wasn’t displayed in the instructions this may be a newbie error on my end but that was hard to realize. Once doing this, and mounting and figuring it all out after a little bit of time. I was able to install and figure this out. I love it, it is very sturdy and the quality of the metal is next to none as well as fit and finish and user friendlyness. The only thing I wish it had was a place for the cord to be doing down and through the desk with the same hole that was drilled for the mount.. Very high quality. I am pushing the weight limit and it held up just fine (just has a little sag, but then again my monitors are very heavy). 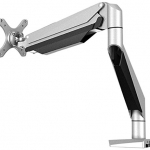 The arms are (I think) hydraulic which made me happy because it allowed me to fully extend my monitors to the left. Overall, a great product, I highly suggest it. 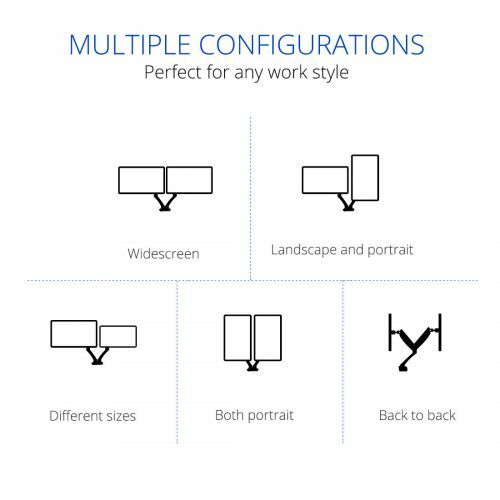 I have 27″ monitors and it works great with and provides outstanding stability for the monitors on the work table. Easy to install, works as advertised. No issues, although I might machine an aluminum sub plate to mount it to my desk to work a bit better than the included plate. Still, a good value for the price. 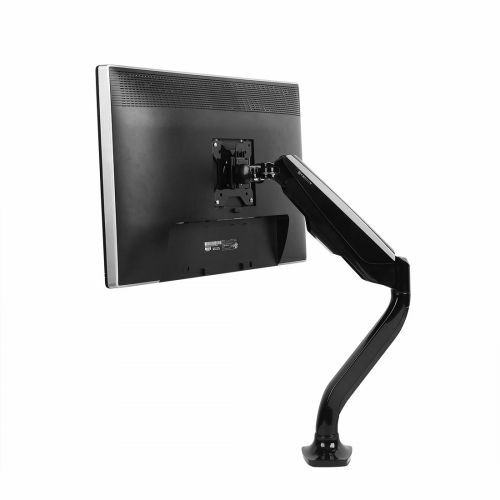 Using on a corner desk with two 24″ monitors. It’s working out well. Glad I made this purchase. Originally bought it for a 27″ UltraWide but I ended buying a 34″ LG UltraWide. I saw the weight of that monitor was within the limit this mount can hold so I decided to try it. Sure enough, it’s holding it up now for about 2 months with no issues. 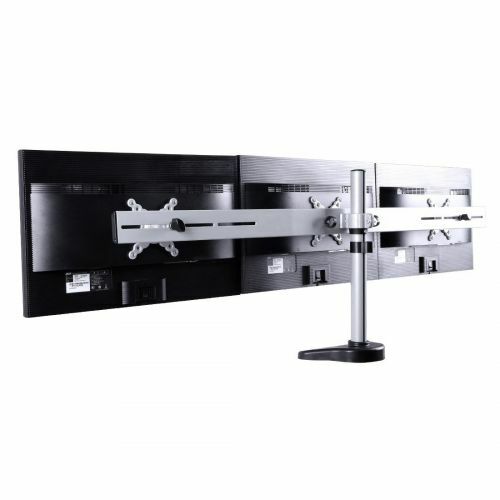 Don’t be afraid to use it on a bigger monitor as long as its weight is within the working specifications of the mount. This mount is FABULOUS! 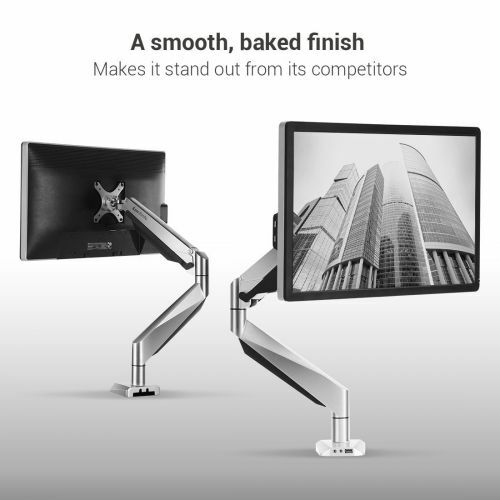 it mounts to my desk very easy and it is very flexible but hold the screen in what ever position i leave it in. plus very easy to move around!! Good price and fits my monitors well. Really impressed! It is what I wanted. I am glad it came with both the C-clamp mount and the desk mount. I tried the C-clamp but did not have enough bit space. I had to modify my desk but the desk mount worked perfectly. The adjustments on the arms was a little tricky but once they are adjusted they do not move. I am so glad that i bought this monitor mount. 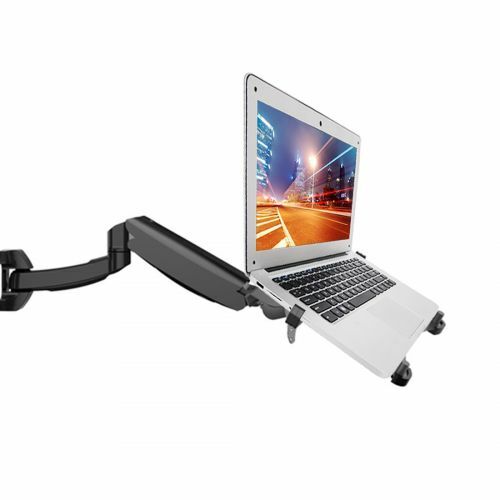 Works great with my Flexispot Standing desk! We have purchased several of these for our school. 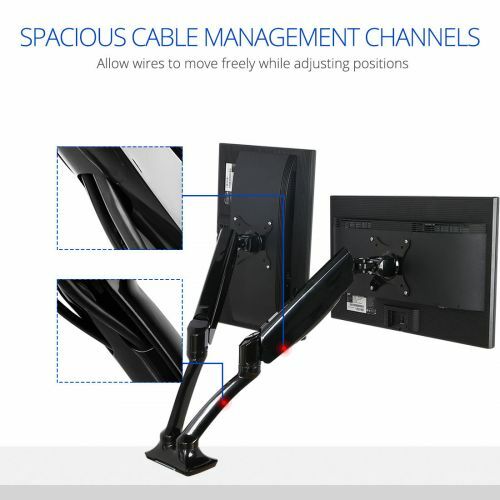 They seem a bit too springy out of the box, but once a monitor is attached, they behave just as well as the more expensive ones we have in use. I have only used the single-arm model. They are sturdy and come with all the hardware for permanent and clamp attachment. We will continue to buy these for any new workstations. This bad boy is a God send. It is a real pain when you have to hold the monitor still, control the mouse and masterbate at the same time. I am glad I got this baby! Well built and versatile. Works great with the HP 21.5 monitor I put on it. Works well and feels like a quality product. Really easy to set up and looks amazing. I set this up by myself with no major issues so far. Made sturdy…works great, now I have bought more fo them!! Excellent! Very easy to install following the instructions. After four months of use it keeps the monitors steady. No complains at all, so far. Working great so far. 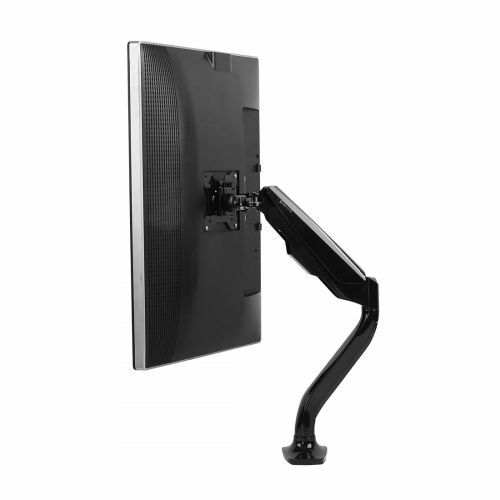 Was hoping the metal shaft that holds the two monitors are available in longer sizes because I have two 27″ monitors. Had to put the top monitor as 24″ in order to stack one on top of the other perfectly. Works as promised. Works perfectly with 23” monitor! Works well, easy to install, adjust, and holds my 22 inch monitor easy. I switched from a standard desk to a mobile sit / stand desk in my bedroom (gaming, falling asleep to youtube, and occasionally working from home) and this mount lets me move the monitor to wherever is most comfortable for me at the moment. 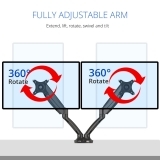 And when I want to be lazy and watch videos in bed I swing the arm around and angle the monitor down: decadence. Slight learning curve on how to sweep the arm into various angles that occasionally sent my pens tumbling when I was first getting used to it, and I had to reset the tension screws once because I move it around constantly, but it really is great for those who are constantly fiddling with their monitor or just can’t find a mount that gets it in the perfect position. When I was assembling it I was like uhh ya, how is this thing gonna work at all. Then as soon as the monitor weight was added it was like oohhhhh I see. 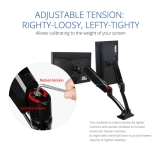 Really solid arm, easy to install, and stays firmly in place. Can’t go wrong. I just set it up, at first glance I thought the quality looked great for the price, and it was easy to install, but didn’t like certain elements at first, like how to get it to move around, but the more I eased up certain joints, and tightened others, it began to work great and it’s ergonomic design, and compartments of cables, allowed me to move it and organize it with incredible ease, definitely recommend this to anyone looking for a great sturdy monitor mount. Great value. Very durable and easily adjustable. 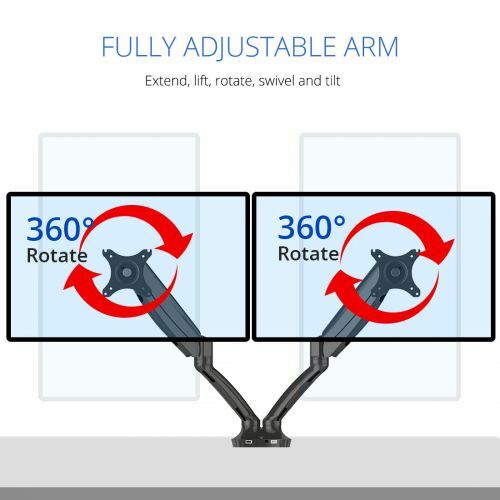 We love it for our Samsung curved monitor. This thing is absolutely awesome. I’ve got an ultrawide LG monitor (at least 40″ wide) that I use. 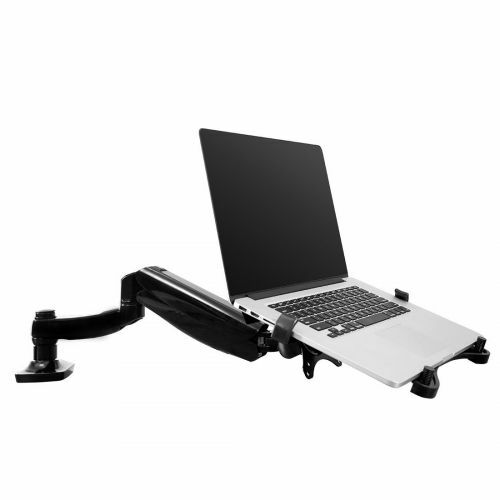 I attached it to my FlexiSpot standing desk and it has worked like a dream ever since it was installed. The movement is great and the adjust ability is second to none. This is a great product! I was leery of this at first, but once I wrangled it to where I wanted it, it is priceless! Item quickly arrived as described. 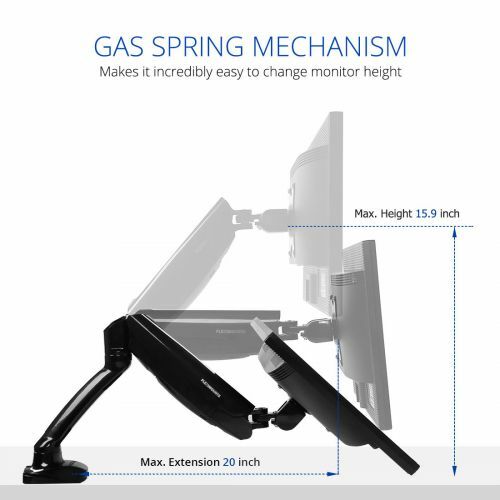 This desk mount monitor stand is excellent. 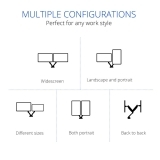 I purchased one for my assistant’s 24″ Dell monitor and it worked so well that we got one for everyone else in the office. 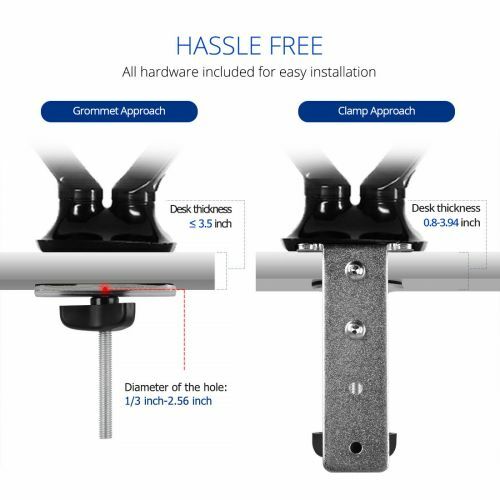 Very good value, easy to mount with clamp or through a desk grommet or by drilling a 1/2″ hole. Well written instructions and parts are clearly labelled. Adjusts easily. Great look and frees up a lot of desk space. Highly recommended. Works great! Full rotation and easy to move. Excellent product, don’t have any complaints and has been holding up nicely and firming with the mount. I needed this for a little 18″ monitor I wanted to use on a rack. You can adjust the spring tension so that the bracket has just the right amount of tension. The hardware in the box is nice and heavy duty; absolutely no disappointments. I was on the fence about buying a mount like this. I like that you can either use a clamp or drill a hole to mount it. In my application I drilled a hole; but the clamp hardware seems really nice and heavy duty. Easy to follow instructions, able to move in many different positions. Just what I was looking for. Bought this in the morning and had installed that night! Pretty straight forward design, had to play with the location and. I’ve the arm a few different ways to make sure I had the best possible spot for it to be installed. Very happy with this mount. The monitor is now off of the desk and at a healthier height, not to even mention the ability to spin it around to the other side of the desk! I’ve purchased so many monitor mounts over the years for both personal use, as well as professional, and this is by far one of the best i’ve ever used. The tension is really solid for my monitor, and it’s really sturdy when connected to my desk. I really appreciate the little channels in it to hide cables, as it makes it that much more of a clean installation for my standing desk. I will certainly go with this brand again if i need another mount. Works great and it’s inexpensive.